The rich array of investment opportunities to be leveraged from effective pan-Arab collaboration was the topic under discussion at a high level business event held today in Sharjah. Hosted by the Sharjah FDI Office (Invest in Sharjah) in conjunction with the Jordan Business Council, the event saw the participation of senior consul generals from across the region and more than 100 stakeholders keen to explore potentially lucrative areas of business engagement. Conceived by Invest in Sharjah – the Foreign Direct Investment (FDI) office operating under the government of Sharjah – the Sharjah-Arab Business Roundtable was held to identify areas of partnership that could lead to mutual benefits for all parties involved in investment initiatives. Included among the senior dignitaries attending were His Excellency Jumaa Abdullah Al Abbadi, Ambassador of Jordan, His Excellency Abdulaziz bin Mohammed Hassan Al Hammadi, Consul General Qatar, His Excellency Deyab Al Rashidi, Consul General Kuwait, His Excellency Abdel Azim Mohammed el-Sadiq, Consul General Sudan and His Excellency Lutfi Bin Amer, Consul General Tunis. Taking place at Sheraton Sharjah Beach Resort & Spa, the Sharjah-Arab Business Roundtable discussed areas of potential collaboration between Arab entities, with a particular focus on small businesses and the key sectors of commerce, real estate and healthcare. Speaking on the historic relationship Sharjah has established with Arab investors since the 1970s, His Excellency Marwan bin Jassim Al Sarkal, CEO of Shurooq, welcomed the high-level attendees, greeting them with the latest insights and information on how Sharjah has been home to several generations of Arab-based investments and companies across multiple sectors. Following the welcome note, which was delivered by His Excellency Ihsan Qatawneh, Chairman of the Jordanian Business Council in the UAE, the panellists took part in the first discussion on the agenda, which covered investment opportunities in the industrial and commercial sectors. Opening the discussion was Rula Al Tarawneh, media personality and technical business analyst, who spoke about the importance of sustaining an open free market. 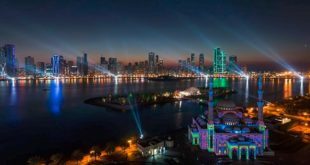 She said that Sharjah’s average low inflation rate of 0.2 per cent year-on-year, with the rate never exceeding four per cent, was proof of Sharjah’s economic success. The first discussion of the roundtable then followed, with its contributors comprising Mr. Muneer Al Kaloti, Chairman of Al Kaloti Group of companies; His Excellency Dr. Abdulaziz Saeed Al Muhairi, Director of Sharjah Health Authority; His Excellency Saud Salim Al Mazrouei, Director of Hamriyah Free Zone Authority and Sharjah Airport International Free Zone Authority, and Mohamed Juma Al Musharrakh, Director of Invest in Sharjah. 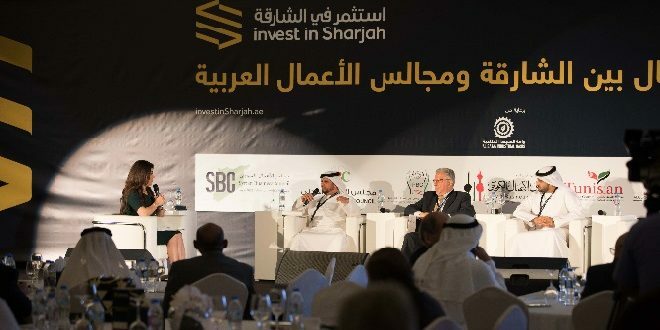 Mohamed Al Musharrakh, Director of Invest in Sharjah, expanded on the role of Invest in Sharjah, which he said was launched to integrate the Sharjah government departments involved in investment and to create a unified direction for them to follow. “We integrate our initiatives with multiple federal partners such as the Ministry of Economy of the UAE, where we find strategic solutions to develop Sharjah’s investment profile and enable ourselves a strategic model for sharing of information, which enables them a stronger outreach to investors wishing to diversify their investments in the UAE,” he said. “We have 13,053 Arab companies registered with the Sharjah Chamber of Commerce and Industry operating in mainland Sharjah and 3,422 Arab companies working out of the emirate’s free zones – a figure equating to 26 per cent of all free zone companies being Arab national organisations. Our role at Invest in Sharjah is to ensure that all entities wishing to invest in the emirate – Arab and international – are given every opportunity and assistance to get their businesses up and running. Once established, we work to ensure that their operations return a healthy profit,” he continued. Al Musharrkh also highlighted Sharjah’s leading and dynamic environmental and waste management and recycling sectors, as well its education sector, in particular Sharjah University City, which hosts more than 12 universities, all of which contribute to developing the emirate’s innovative and knowledge-based economy . Mr. Muneer Al Kaloti, Chairman of Al Kaloti Group of companies, spoke about how Sharjah’s ease of import, export and conducting business was a key aspect of his organisation’s success, with qualities such as high levels of logistics, safety, security and transport positioning the emirate as the leading destination for his sector. Speaking about Sharjah’s booming healthcare sector, His Excellency Dr. Abdulaziz Saeed Al Muhairi, Director of Sharjah Health Authority, highlighted that it was worth approximately USD 2 billion in 2016, with the overall UAE healthcare sector forecast to grow at seven per cent annually to 2020. He pointed out that the forthcoming Sharjah Healthcare City will be one of the region’s largest healthcare free zones and that Sharjah had been named as the first Healthy City in the Middle East by the World Health Organisation. “Studies conducted by PwC, Shurooq and other resources have highlighted the significance of Sharjah’s healthcare sector, whether in SME health-related investments, hospitals or specialised medical centres. We focus on developing facilities, technologies and services that make investors’ access to Sharjah’s healthcare market easy and we support their investments through continuous market research. 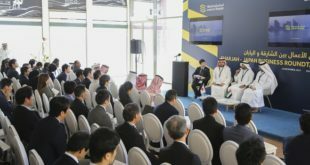 Sharjah Healthcare City will focus on promoting light to medium manufacturing industries and investments in their respective specialisations,” he said. Discussing how free zones were the life blood of Sharjah’s economy, His Excellency Saud Salim Al Mazrouei, Director of Hamriyah Free Zone Authority and Sharjah Airport International Free Zone, spoke of how the zones were transforming themselves into centres of innovation and excellence. 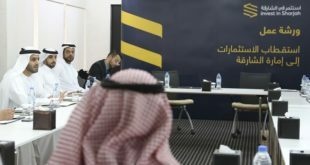 “Hamriya Free Zone is committed to developing new services and initiatives that are transforming and optimising Sharjah’s free zones into fully integrated areas that allow investors hands-on access to insights, information, data and services that directly cater to their needs and requirements,” he said. Taking part in the second panel discussion at the roundtable, which focussed on real estate investment opportunities, were Humaid Al Abbar, Consultant of Sharjah Real Estate Registration Department; Marwan Al Zaiem, Chairman of Al Marwan General Contracting in Sharjah and Abdulaziz Fekri, Director of Al Sajaa’a Industrial Oasis. “The total market size for the buying and selling of land in Sharjah in 2016 was worth AED 24 billion. Arab investors are always looking for easy regulations and strong market penetration, which is why Sharjah has always been a primary choice for Arabs investing in the UAE. Investor confidence in the emirate is very high because of this. We formulated rules and regulations to support the growth of this strategic sustainability. 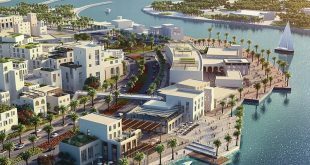 For example, Tilal City developed new multi-community projects that will house more than 60,000 individuals, in addition to this, more high level projects continue to project investment growth in this sector in Sharjah,” commented Al Abbar. Launched at the Sharjah FDI Forum in September 2016, Invest in Sharjah aims to help investors and entrepreneurs maximise the potential of their operations by providing them with guidance and direction on opportunities that lead to the growth of their businesses. It enhances cooperation and partnerships between entities to ensure the achievement of the desired growth and facilitates the exchange of expertise and knowledge of the unique cultural, commercial and social environment in Sharjah.